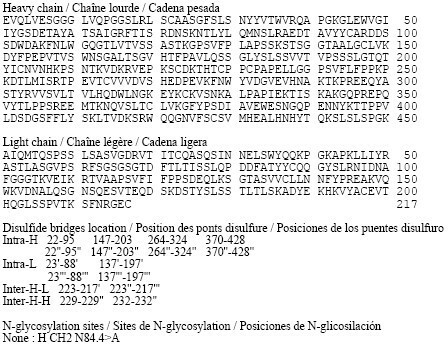 CMX8521 is a nucleoside analog that inhibits the norovirus RNA polymerase. 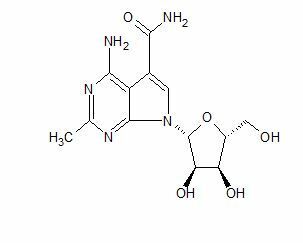 CMX8521 has in vitro activity against mouse and human norovirus.Where possible, Chimerix uses its lipid conjugate technology to build nucleoside-analog antivirals that are orally absorbed and have favorable tissue penetration. CMX-8521 (presumed to be CMX-521) being developed by Chimerix for treating norovirus infection. In June 2018, a phase II efficacy trial was planned in 2019. (3R,4R,5R)-2-acetoxy-5-((benzoyloxy)methyl)tetrahydrofuran-3,4-diyl dibenzoate remaining. 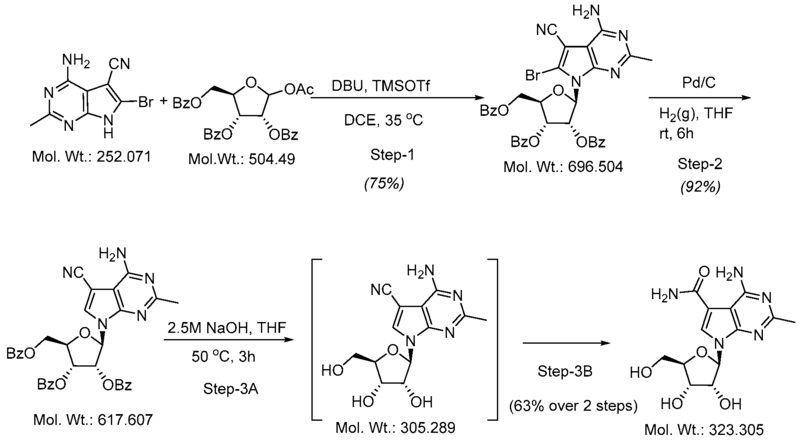 IPC after 03h and 16 min at approx.32 °C showed 2% 4-amino-6-bromo-2-methyl-7H- pyrrolo[2,3-d]pyrimidine-5-carbonitrile (3.00 kg), (3R,4R,5R)-2-acetoxy-5- ((benzoyloxy)methyl)tetrahydrofuran-3,4-diyl dibenzoate remaining (spec:≤3%). The reaction mixture was diluted with DCM (39.81 kg) and quenched with potable water (15.02 kg) over an 11 min period between 9.5 °C and 15.6 °C. The extractive work-up (at approx.22 °C) was completed by a back extraction of the aqueous phase with DCM (19.90 kg), a wash with sat NaHCO3 (1.3 kg NaHCO3 in 14.9 kg potable water), a back extraction of the bicarbonate phase with DCM (19.71 kg) and a wash with brine (4.5 kg NaCl in 14.9 kg potable water). Note: the reactor was cleaned with potable water, acetone and DCM after each wash/back extraction. The drummed organic phase containing the product was charged to the 100-L jacketed reactor through an in-line filter followed by a DCM rinse of the drum and filter with DCM (2.48 kg). The contents of the reactor were distilled to 31 L with the aid of vacuum over a period of 06 h and 04 min with a maximum temperature of 50.1 °C. At this point a thick suspension had formed. Next, over a period of 39 min, IPAc (41.88 kg) was added between 44.5 °C and 49.5 °C and the contents of the reactor were heated to 76.9 °C over a period of 01 h and 25 min. Next, the contents of the reactor were cooled to 9.9 °C over a period of 04 h and 21 min and stirred for 12 h and 26 min with a minimum temperature of 1.6 °C. Step 1 (Protocol # 2): To a 100-L jacketed reactor were charged 4-amino-6- bromo-2-methyl-7H-pyrrolo[2,3-d]pyrimidine-5-carbonitrile (3.00 kg), (3R,4R,5R)-2-acetoxy-5- ((benzoyloxy)methyl)tetrahydrofuran-3,4-diyl dibenzoate (6.60 kg) and DCE (18.80 kg). Stirring was started and DBU (3.59) kg was added. Over a period of 01 h and 46 min, TMSOTf (7.90 kg) was added between 30.4 °C and 34.2 °C. 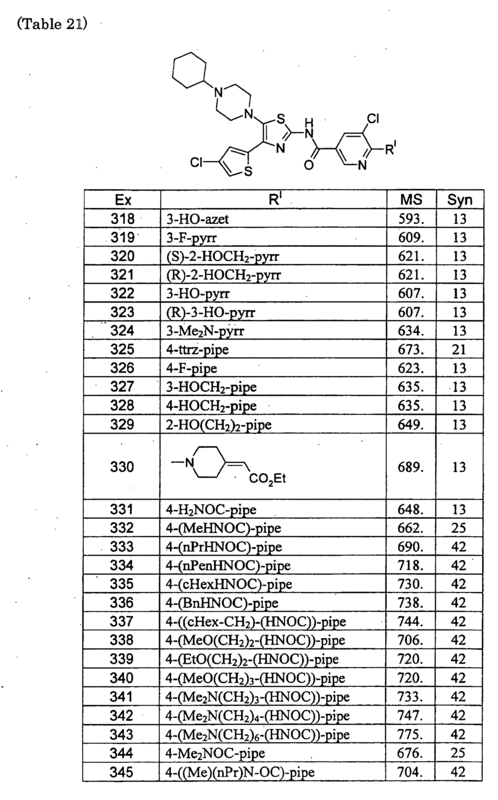 IPC after 02 h and 49 min at approx.34 °C showed 1% of 4-amino-6-bromo-2-methyl-7H-pyrrolo[2,3-d]pyrimidine-5-carbonitrile remaining (spec: ≤3%). The reaction mixture was diluted with DCM (40/70 kg) and quenched with potable water (14.97 kg) over an 04 min period between 9.9 °C and 18.0 °C. The extractive work-up (at approx.22 °C) was completed by a back extraction of the aqueous phase with DCM (20.34 kg), a wash with sat NaHCO3 (1.30 kg NaHCO3 in 14.90 kg potable water), a back extraction of the bicarbonate phase with DCM (20.65 kg) and a wash with brine (4.50 kg NaCl in 14.96 kg potable water). Note: the reactor was cleaned with potable water, acetone and DCM after each wash/back extraction. The drummed organic phase containing the product was charged to the 100-L jacketed reactor through an in-line filter followed by a DCM rinse of the drum and filter with DCM (1.49 kg). The contents of the reactor were distilled to with the aid of vacuum over a period of 04 h and 49 min with a maximum temperature of 45.6 °C. At this point a thick suspension had formed. Next, over a period of 27 min, IPAc (41.70 kg) was added between 45.6 °C and 48.2 °C and the contents of the reactor were heated to 75.7 °C over a period of 01 h and 20 min. Next, the contents of the reactor were cooled to 9.4 °C over a period of 04 h and 15 min and stirred overnight with a minimum temperature of 2.3 °C. 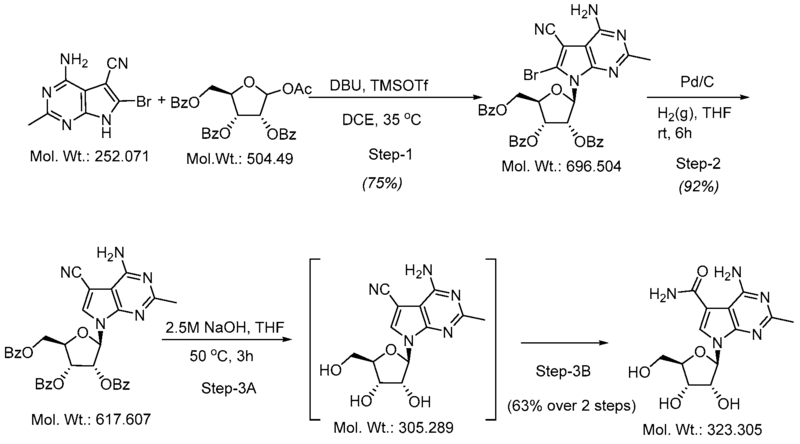 (2R,3R,4R,5R)-2-(4-amino-6-bromo-5-cyano-2-methyl-7H-pyrrolo[2,3-d]pyrimidin-7-yl)-5- ((benzoyloxy)methyl)tetrahydrofuran-3,4-diyl dibenzoate could no longer be detected. The reaction mixture was filtered over Celite (7.2 kg) and a polish filter and the filter residue was washed with THF (5.2 kg). The combined filtrate and wash was transferred to a 100-L jacketed reactor with the aid of a THF wash (2.12 kg). The contents of the reactor were vacuum distilled with a maximum batch temperature of 30.0 °C over a period of 05 h and 38 min to a final volume of 27 L. IPA (31.48 kg) was charged over a 40 min period to the reactor between 39.7 °C and 53.2 °C. The contents of the reactor were vacuum distilled with a maximum batch temperature of 53.2 °C over a period of 03 h and 02 min to a final volume of 33 L. IPA (48.99 kg) was charged over a 43 min period to the reactor between 53.1 °C and 57.1 °C. The contents of the reactor were heated to 60.2 °C, agitated for 12 min and cooled over a period of 04 and 28 min to 5.4 °C. Cold stirring was continued for a period of 08 h and 55 min with a minimum temperature of 1.1 °C. The slurry was filtered and washed with IPA (9.41 kg, at approx.4.5 °C). The residue was dried under vacuum with a nitrogen bleed for a period of 11 h and 44 min at a maximum temperature of 44.0 °C to provide an LOD of 0.36%. Yield: 6.58 kg (73.9 %).1H NMR confirms structure. Purity: 97.78 % (HPLC, AUC). 1100 g NaOH dissolved in potable water to a total volume of 1 L; 2 Diluted 500 mL conc. HCl in 2 L total with potable water  A solution of (2R,3R,4R,5R)-2-(4-amino-5-cyano-2-methyl-7H-pyrrolo[2,3- d]pyrimidin-7-yl)-5-((benzoyloxy)methyl)tetrahydrofuran-3,4-diyl dibenzoate and THF was heated to 54 °C and the addition of 2.5 M NaOH was started. The initial addition gave a biphasic mixture and endothermic response (the temperature dropped to 50 °C) but as the addition continued a single phased, clear solution formed which was accompanied by a fast exotherm to 61 °C; the reaction temperature was maintained at 60 °C to 61 °C during the rest of the addition and for an additional 2 ½ h. IPC showed that no (2R,3R,4R,5R)-2-(4-amino-5-cyano-2-methyl- 7H-pyrrolo[2,3-d]pyrimidin-7-yl)-5-((benzoyloxy)methyl)tetrahydrofuran-3,4-diyl dibenzoate was left. The reaction mixture was cooled to 21 °C and neutralized with 3 N HCl with external cooling to pH = 7.06 (Denver Instrument UB-10 pH meter equipped with a Sartorius P- P11 pH electrode, the electrode was checked with buffer solutions of pH = 4.00 and pH = 7.00); the mixture continued to cool to 8°C. The resulting neutralized mixture was distilled under vacuum with a pot temperature of 45 °C to 50 °C until the emergence of solids were observed in the pot. The suspension was cooled and stirred for 2 h at 2 °C. The beige suspension was filtered to afford a dark filtrate; the off-white residue was washed once with cold water (500 mL, 5 °C). A first LOD after 16 h gave a value of 18.73 %. HPLC) of the drying material showed the presence of 1.6% benzoate. (solubility 1 mg/mL).HPLC data for compound 1 were obtained with a method suitable for polar compounds using a Zorbax Eclipse Plus C18 column (water / ACN / TFA, 97.5 / 2.5 / 0.05). This is the same column used for steps 1 and 2. The disclosure can be embodied in other specific forms without departing from the spirit or essential characteristics thereof. The foregoing embodiments are therefore to be considered in all respects illustrative rather than limiting on the disclosure described herein. Scope of the disclosure is thus indicated by the appended claims rather than by the foregoing description, and all changes that come within the meaning and range of equivalency of the claims are intended to be embraced therein. 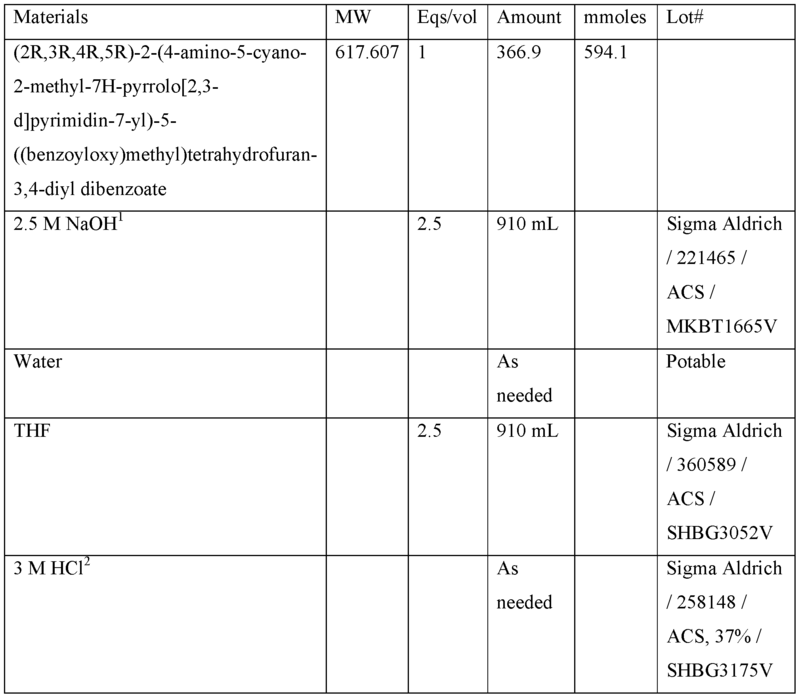 Novel crystalline forms of 4-amino-7-((2R,3R,4S,5R)-3,4-dihydroxy-5-(hydroxymethyl) tetrahydrofuran-2-yl)-2-methyl-7H-pyrrolo[2,3-d]pyrimidine-5-carboxamide and their stable hemihydrate crystalline forms (designated as Form A-G), processes for their preparation and compositions comprising them are claimed. Also claimed is their use for treating viral infection. Viral infections can have serious adverse effects on individuals and society as a whole. In addition to fatal viral infections such as Ebola, even non-fatal infections can have serious societal and economic consequences. For example, human noroviruses (NV) are the most common cause of epidemic acute gastroenteritis worldwide with an estimated 19-21 million cases each year in the United States including 56,000-71,000 hospitalizations and 570-800 deaths (Hall et al., Emerg.Infect.Dis. 2013 Aug; 19(8): 1198-205). 4-amino-7-((2R,3R,4S,5R)-3,4-dihydroxy-5-(hydroxymethyl) tetrahydrofuran-2-yl)-2-methyl-7H-pyrrolo [2,3-d]pyrimidine-5-carboxamide (Compound 1) is an antiviral drug. By DR ANTHONY MELVIN CRASTO Ph.D in PHASE 1, PHASE1 on April 3, 2019 .